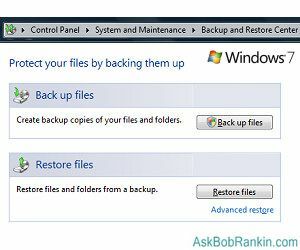 To access the Windows 7 Backup and Restore Center, open the Control Panel, click on System and Maintenance, then click Backup and Restore. For a shortcut, click Start and type "backup" into the search box. Click on the "Backup and Restore" link in the search results to open the Backup and Restore Center. From there, you can create a complete system image backup and a system repair disc; configure a selective backup of critical libraries, folders, and files; or restore items from previous backups. Most people will use an external hard drive to hold their backup copies. But you can also use a CD or DVD drive, a secondary internal drive, a network drive, or even a USB flash drive. Windows 7 Backup will not let you save a backup over the Internet or on the same drive that holds Windows. See my article All External Hard Drives are Not Created Equal for some tips on buying an external hard drive. You can let Windows choose what to back up, or manually specify your own choices. If you let Windows choose, it will back up data files saved in libraries, on the desktop, and in the default Windows folders for all user accounts on the computer. Default folders include AppData, Contacts, Desktop, Downloads, Favorites, Links, Saved Games, and Searches. If the destination drive is formatted with NTFS and is large enough, a system image will be saved along with the backup. For more information on the difference between a backup and a system image, see my Hard Drive Backup Image article. If you choose what to back up, you can select libraries, folders, or drives to back up. However, files in Windows system folders and files identified in the registry as parts of programs will not be backed up, even if their folders are selected. Also, you cannot back up files that are in the Recycle Bin, or that reside on a drive that was formatted with the old FAT file system. After choosing what to back up, you can schedule when to perform backups automatically, or tell Windows not to schedule automatic backups. In the latter case, you will have to start a backup manually. I strongly recommend an automatic backup. Trust me, if you think you'll remember to do it on your own, you won't. Windows 7 Backup does incremental backups. Only files which are new or changed will be backed up. Incremental backups save time and disk space. Since several backups from different times can be saved, you can restore any of several versions of a file. My preference is to make a full backup weekly, and supplement with daily incrementals. Depending on how often you create or update files, you might get by just fine with a monthly backup and weekly incrementals. When restoring files in Windows 7, you have several options. You can restore all of your own files; all of the files of all users on a computer; selected folders; or selected files. You can also search for files by type, such as all JPG or DOC files in a backup. Finally, you can specify a particular user whose files you want to restore, which is useful if you have multiple user accounts on your PC. Windows 7 Backup and Restore has some limitations you won't find in commercial backup products. But for most home and small business users, the backup utilities in Windows 7 are sufficient. If you want to check out other options, see my guide to Free Backup Solutions. Most recent comments on "Windows 7 Backup and Restore "
Excellent tips and instructions here. 48 hours ago I upgraded from Windows XP Home to Windows 7 on a new box. My first effort at using Windows backup and restore produced an error message for which there was no explanation available and no recourse for me to follow. The backup failed. Rather than involve myself in the never-ending Windows circus of error messages, I opted to use the software that runs my Maxtor BlackArmor external hard drive. That, of course, worked perfectly, my first backup ran without a hitch, and daily backups are now scheduled. When time allows, I'll look into the Windows error message further, but setting up a new box the way you want it takes many hours and the alternative for this issue has solved my immediate problem. It's in the Book: "Blessed are the pessimists, for they hath made backups." Windows backup, both image and files, is second-rate. Freeware tools are better and more intuitive. For images use Macrium, Paragon, Redo, or PING. PING is great because it creates the backup from a CD without Windows running. Back4sure is a great file backup tool that saves the files in native format, which for me is critical. Don't forget the drivers. DoubleDriver can save the EXE with the driver backup to make restoration a snap. Forget the Microsoft backup tools. They are wanting. When did Microsoft give us anything worthwhile without extorting money from us? I use Windows 7 to make a system image of my computer every couple of months. In addition, all of my documents are backed up on a USB thumb drive and on an external hard drive. I also have them stored online in Skydrive. My pictures are backed up on a different USB thumb drive and on the same external hard drive where my documents are stored. The pictures are also stored online in Picasa in my Gmail account. I have also made a back-up copy of my photos in my Picasa desktop account using Picasa's back-up and restore system and have them stored on a separate external hard drive. But, I have often read how much you like Acronis True Image for making a mirror image of a computer's hard drive. Do I have just as good a mirror image of my hard drive using the Windows 7 system image, or would I be better off with Acronis? Also, would a mirror image off Acronis or the Windows 7 system image restore everything on my computer in case of a hard drive failure without having to use the info on my thumb drives and external hard drives? EDITOR'S NOTE: I can't say that a system image made by Win7 is inferior to one made with Acronis. I'm just most confortable with Acronis and like all the features it offers. And yes, a system image will restore everything. I use Mozy Home to backup my computer. It is a backup service online. I went this route in case of a fire that would burn the computer and the external disc. I had to dump Acronis because of repeated and irritating backup failures. Windows 7 Backup has served me fine, and comes with the OS. I have had no trouble restoring the occasional fat-fingered file. It doesn't let me get as close to the metal as I would like, but it has served its purpose admirably. I was having a heck of a time trying to back up my Windows & computer. The Windows back up worked in April 2011 but every time after that I got a message to say the back up failed with error code 0x8078012D. I tried googling the code -no help. I tried 3 or 4 different "fix your computer scans" - just the same. Just recently I tried again, googled the error code, found a forum where the instructions didn't match my computer, and another that said to use a after market back up program and that there were several free ones available. I downloaded EaseUS Todo Backup Free 3.0 because of it's review and usaer ratings and also because it was available from a site which I trust. It works! A full system back up and a documents back up later I am a happier and much relieved computer owner. I just have to have faith that when something happens to my hard drive that it will restore. I had a bad system crash -- couldn't even boot. I had to do a full System Restore, which wiped out everything. Fortunately, I had made a full image backup the week before. Unfortunately, the Restore Backup function can't see the image file, even though Windows Explorer shows it.